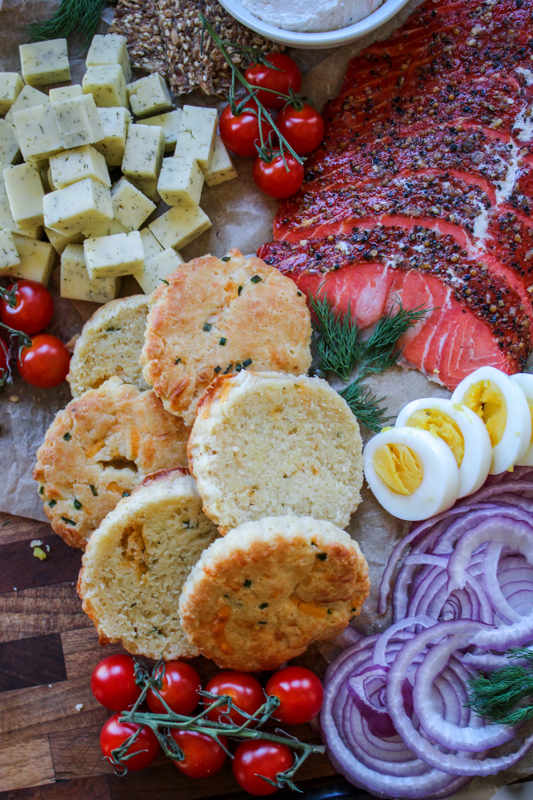 This smoked salmon board is basically the brunch version of a charcuterie board. Classically, you would probably find a big ol’ pile of bagels next to this platter of deliciousness, and I’m cool with that (you do you, boo). But, living and eating that low carb life means bagels are out. Even though I do not for a second feel like I’m missing out. There’s a difference! In fact, I feel more energetic, less bloated, and less hungry eating this way. I know it’s not for everyone, but know that there is still good food and good eating outside of bagels, donuts, and breakfast cereal in the morning. 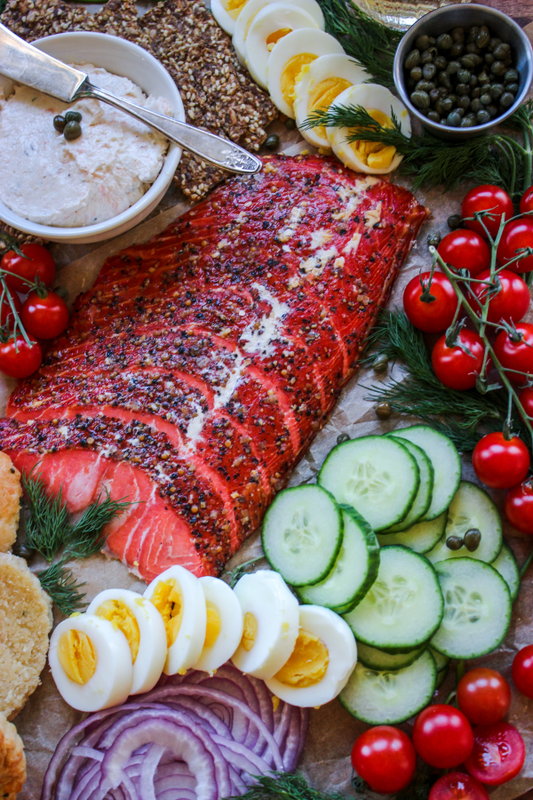 This smoked salmon smorgasbord is the perfect way to share lower carb options when you’re entertaining a group, hanging on a Saturday morning with bae, or using the excuse of being a food blogger to basically just make this for yourself. All reasons are valid…. 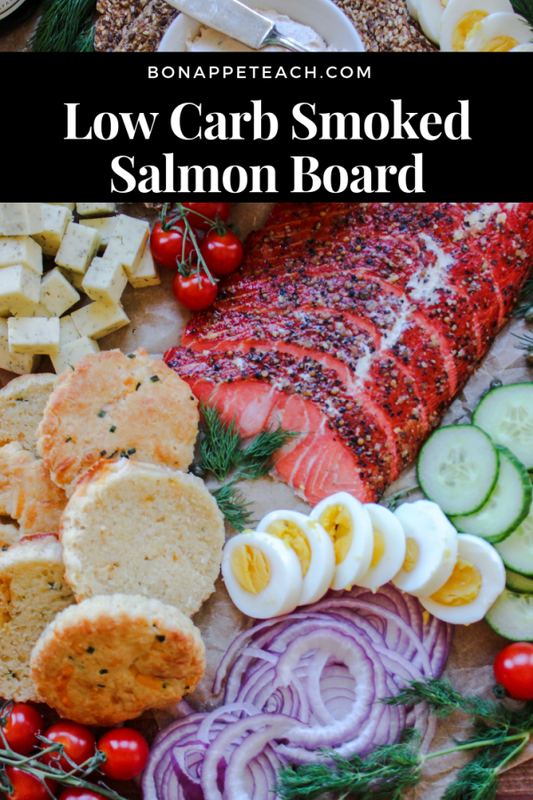 Super easy to customize and put together, read through and find out how you can build your own Low Carb Smoked Salmon Board too at home to share (or not share)! This board is totally customizable and easy to make for both your low carb/ keto/ gluten free eaters as well as your carb eaters too! That’s why I love this SO much! Because there is no “right” way to do this, I’m going to just break this down into categories on what to include and you can follow my guide or just use it for inspiration to make your own! 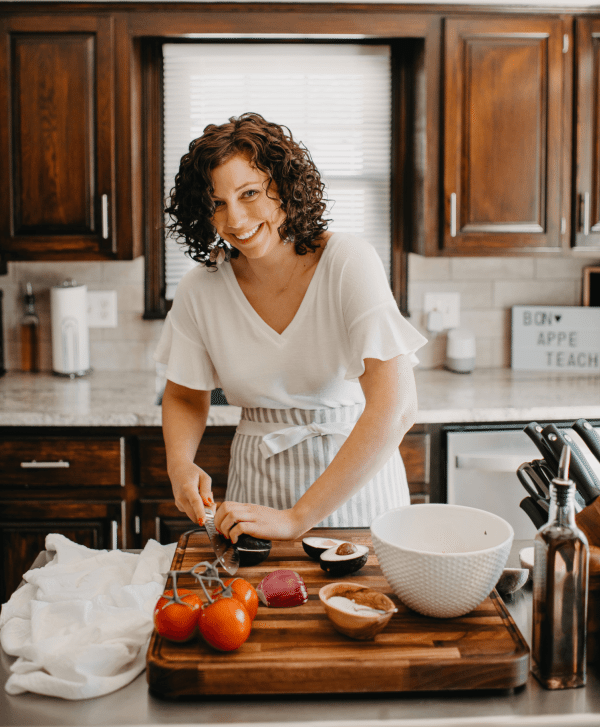 I think the biggest thing my low carb and gluten free eaters want to know about are my classic bagel and cracker substitutes. There are plenty of keto fathead dough bagel recipes out there, and you could absolutely make those to go with this board. I however, am not a fathead dough fan (personal preference). I find it to be a lot of work and really only great as a pizza crust substitute. For that reason, I opted to go with my Keto Almond Flour Biscuit recipe because they are so easy to make and work great when cut in half and eaten open face (almost like an English muffin). 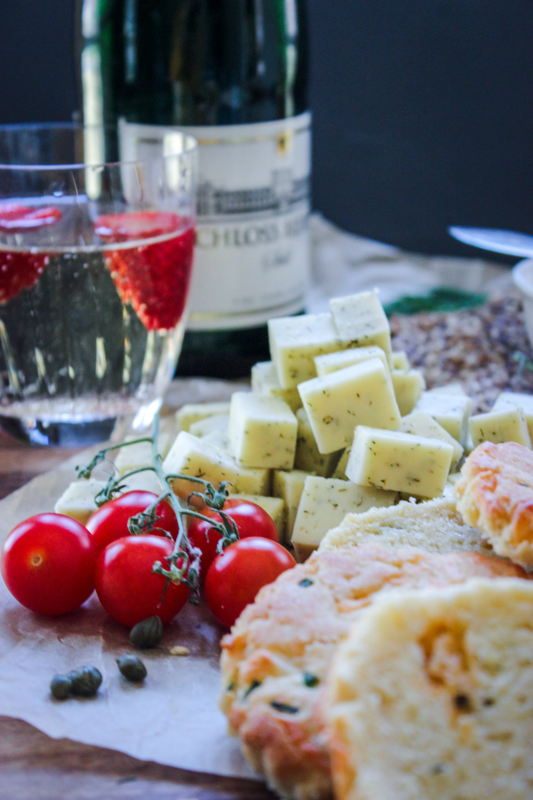 If looking to keep things simple too, opt to go with the gluten free crispbread cracker from Trader Joe’s (aka flackers) for dipping as well. Leave them whole, break them up, do whatever works, but for 3 net carbs they’re a great option in my opinion! Additionally, if you don’t have TJ’s near you an still want a low carb/ GF/ keto cracker option, try my keto crackers recipe or even make crispy tortilla chips from a store bought low carb tortilla too! The main stand out protein here is obviously the salmon. I went with a wild caught Alaskan smoked sockeye salmon. I prefer wild caught over Atlantic (farmed) salmon personally. Just pick which salmon floats your boat and add it to the board! The other main proteins I have here are my cheese and hard boiled eggs. A good white cheddar or the havarti dill (pictured) just adds a great way to snack off the board. 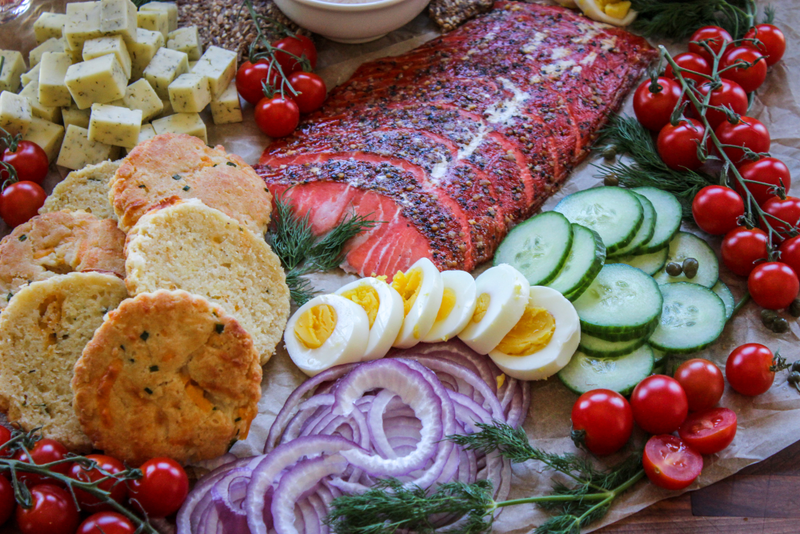 I like the slices of hard boiled eggs to add to the open faced bagels and pair well with the other toppings and the salmon. I stuck with the classic veggies that pair well with smoked salmon. I used slices of English cucumber (it’s seedless and so much tastier), some vine ripened cherry tomatoes, and thinly sliced red onion. Toss these around the board in various places to add pops of color and easy access for hands to grab and smash into one’s face hole. Cause we so classy. I like to add some whipped cream cheese or smoked salmon dip. 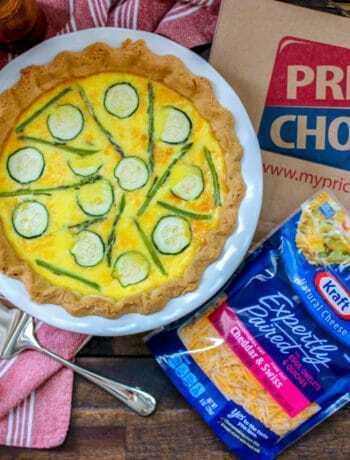 This pairs nicely with the keto biscuits and crackers, and makes for a great dip too with the veggies. Add in a few capers and some fresh dill to tie the whole board together. 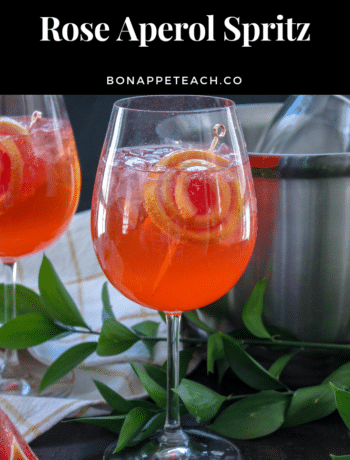 I hope you love this idea for entertaining as much as I do. I think boards like this make a great centerpiece and are a great way to incorporate a lot of different foods for different diets and lifestyles! 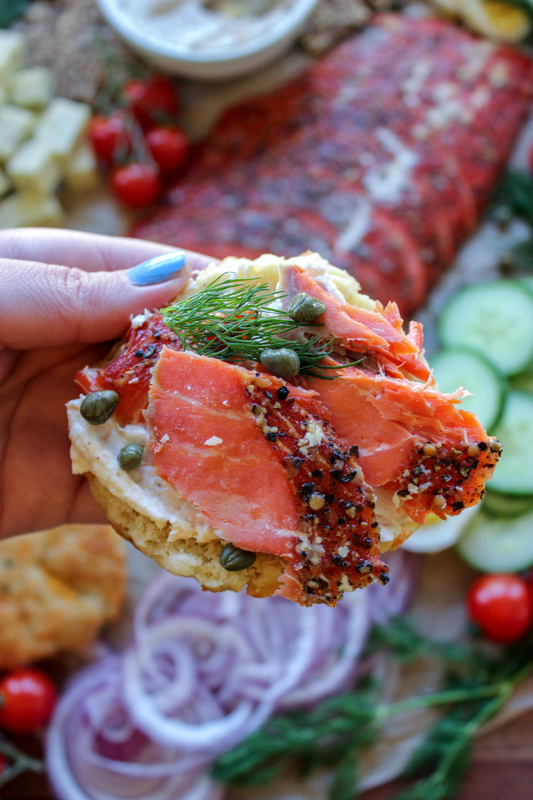 A low carb and gluten free way to enjoy everything you loved about a bagel and lox (but with way fewer carbs). Prep all your ingredients and arrange them on a large cutting board or platter!